The Chapel Sanctuary was erected to commemorate Sister Jane Ashdown and to former boys of the children's home who lost their lives in World War One. 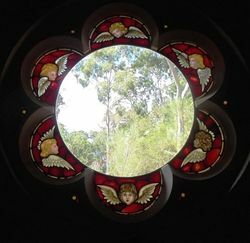 Parkerville Childrens Home was founded in 1903 by the Sisters of Charity, one of whom was Sister Jane Ashdown who had accompanied a party of fourteen orphaned or abandoned boys from England and regarded them as her special charges. At the outbreak of World War One these boys were of military age and all volunteered for Army service. 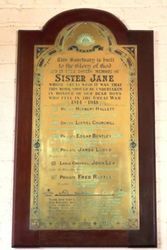 Sister Jane wrote to them regularly whilst they were away and grieved for those who died, some of whom left money to her in their wills, this money she donated in their memory to the building of additions to the small wooden chapel that had been built in 1909 in the grounds of the Home. These additions comprising brick apse,rose window and Honour Board were consecrated by the Archbishop of Perth in 1923. Sister Jane died in 1921. Thank God that Love is Mightier still than Hate and Bravery makes one kindred of the World. Love kindles love and deeds of bravery makes God above speak gloriously.